Now for the first time ever, you can share a Bible verse — as an image — from directly inside the Bible App on your Apple or Android device. Did a verse encourage you today? Inspire you? Or even challenge you? Share it with your friends as an image. It’s easy! Tap the passage you want to share. Choose from dozens of beautiful, high-resolution backgrounds. Customize your image with fonts, colors, and other effects. 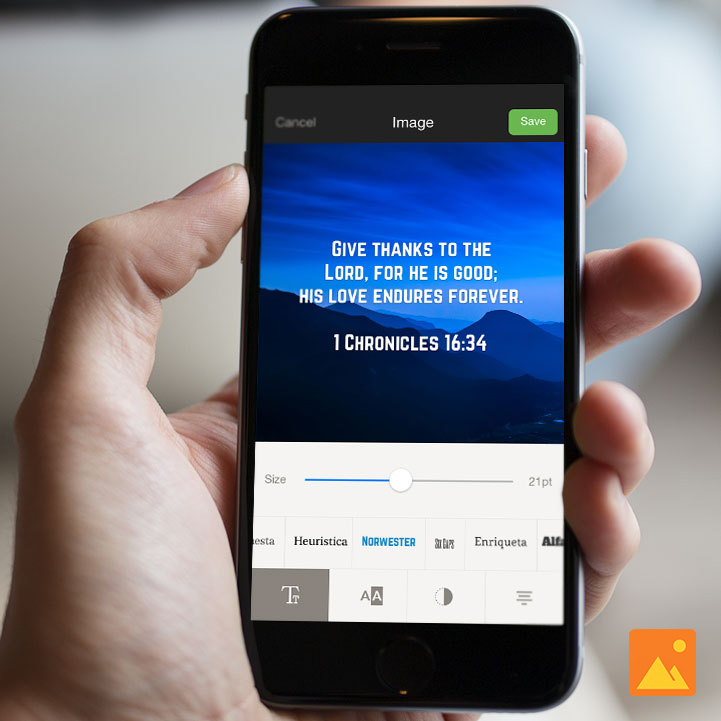 Share your verse image directly into your Bible App Home feed, as an SMS or email message, or on social media. In addition, many verses contain pre-designed verse images with special text artwork. When you select one of these, you are able to simply share it from there without needing to do anything else! The Bible App™ has been installed on more than 170 million unique devices, all over the world. Developed by YouVersion, the Bible App offers more than 1,000 Bible versions, in more than 770 languages. And it’s always completely free.